It's Friday and we're going to a Halloween party this evening. One of my friends' neighbors is the town's deputy police chief and he and his partner give an annual costume party, and we were invited. We're going as New York Yankees in honor of the World Series. 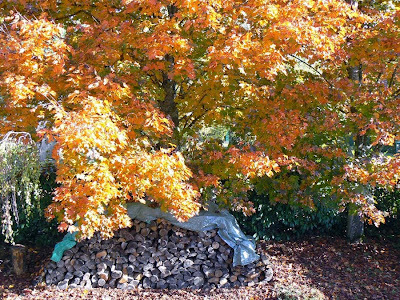 The cemetery cake, surrounded by autumn leaves. We're wearing Yankees tee-shirts, our Yankee caps, and we're smudging black lipstick under our eyes. There may be a baseball glove or two involved. And my friends are bringing a dessert for the food buffet. Lorraine wanted to make a cake she saw on television. The cake is a dark chocolate brownie cake. 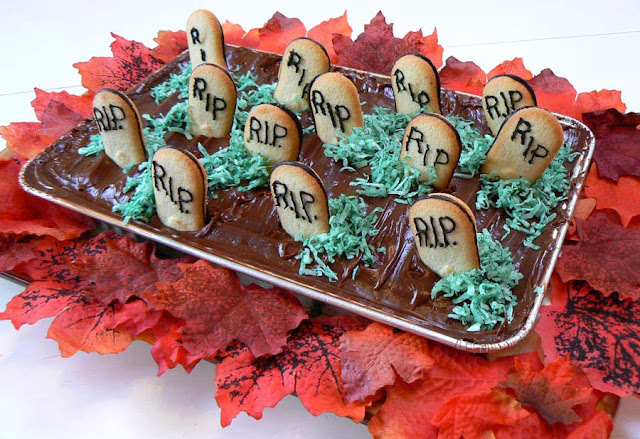 Pepperidge Farm Milano cookies are stuck in the cake as tombstones, with "R.I.P." written on them with icing. Finally, grated coconut is colored green and placed around the tombstones to simulate grass. 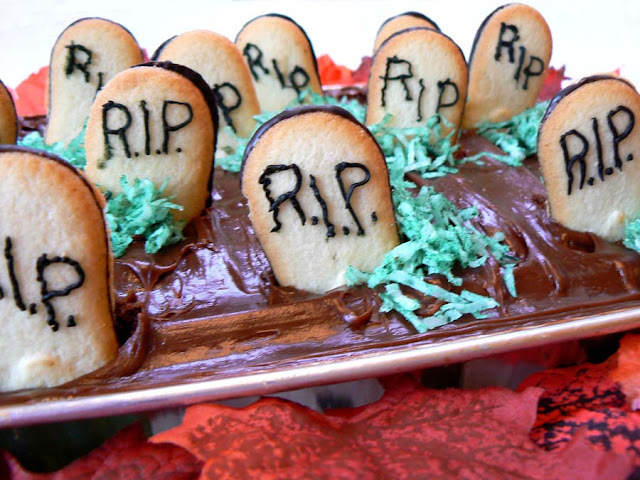 It's a cemetery cake! Lorraine and I put it together Friday afternoon. We're headed over to the party this evening. It's always fun to taste local wines wherever you are in the world. I'm lucky to be from New York, whose wine industry has really grown and matured over the last thirty odd years, and when I'm back I like to taste some of the wine. 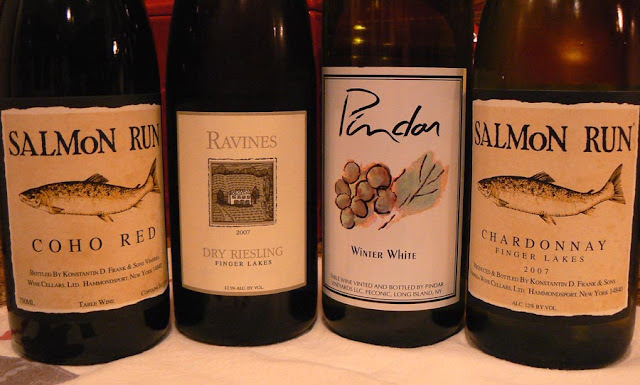 Some local New York State wines. I picked up the three Finger Lakes wines yesterday, and my hosts suggested we try the Long Island late harvest (Pindar's Winter White) while I'm here. We opened up the Riesling on Wednesday evening and it was pretty tasty. It's slightly sweet even though the bottle says it's dry, but not too much, and it's flinty, too, with some interesting fruit flavors that border on citrus. I can't wait to taste the others! Trains, planes, and automobiles. Wasn't that a movie? It's what I did on Tuesday. Ken drove me to Tours where I got my TGV directly up to the airport in Paris. 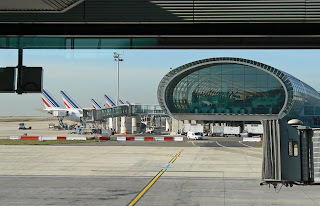 The train was perfectly on time and in one hour and forty minutes I was in Terminal 2 at Charles de Gaulle. 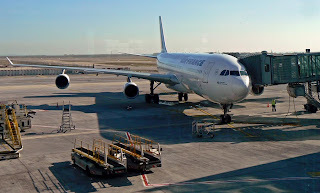 Our aircraft, an Airbus 340-300, ready to board. Check-in was simple; I already had my boarding pass thanks to the internet. Security was ok, too. No taking off of shoes or belt. The only glitch there was that I had a metal carabeener attached to my carry-on that I was using to attach my camera bag. That way the two bags would be hooked together and I'd be less likely to lose the smaller one. The security guy confiscated my carabeener. He said it might be usable as une poignée américaine. Brass knuckles. 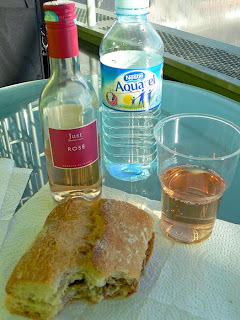 My little snack: a pâté sandwich from home, and Just Rosé (it was Cinsault). He even demonstrated how for me right before he tossed it into the plexiglass box with all the no-no items. Funny how the French call brass knuckles "an American fist." Our culture must look so violent to them. Otherwise, everything went smoothly. I had a little snack at the airport since I had some time to kill. I also bought a newspaper, but didn't read it because I was having too much fun people watching. The flight left precisely on time and landed in Boston a half-hour early. I got my rental car and was zipping along the Mass Pike in no time. I was very tired, however. It was misty in Boston and getting dark by the time I got on the road. There was a little traffic in the 'burbs, but nothing horrible. It rained pretty well when I headed over the Berkshires, but cleared up by the time I descended into the Hudson Valley. Part of Terminal 2E, seen from near my gate. And now I'm here! I slept about five or six hours overnight. We'll see how day one goes. Right now there's a light rain falling outside, but it's not cold. I slept with my window open. The sun's not up yet, so I'm having some tea and messing around with the computer. I love wireless networking! If all has gone according to plan, I'm on my way to New York. 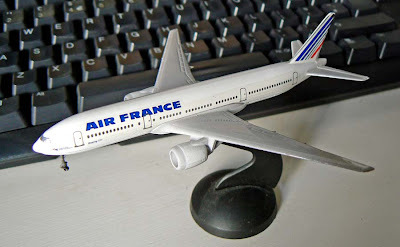 I'm taking the train very early this morning to Charles De Gualle airport, then flying via Air France to Boston. Clothes are packed. Batteries are charged. Tickets are in order. Passport and other documents gathered. Once in Boston, I'm picking up a rental car and driving to Albany, NY, my home town, which should be about a three hour drive. I have a laptop, so I'm hoping I'll be online and posting during my trip. 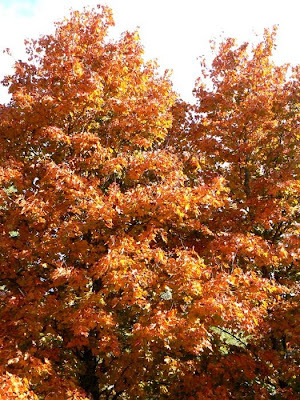 The red maple trees turn orange in the fall. I'm leaving early Tuesday morning for two weeks in upstate New York. Heading home to see family and friends, and to shop for some clothes. I'll be trying to post some travel photos and stories from the road, so keep checking in if you'd like. Soon all these leaves will be on the ground. Ken and Callie are staying home to guard the house. I saw this recipe on Cuisine TV and instantly knew that I wanted to make it. So Saturday was the day. We bought some leeks for the occasion. 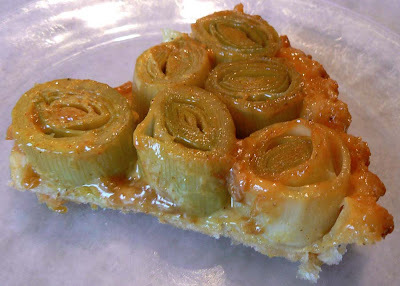 It's an upside down leek tart. 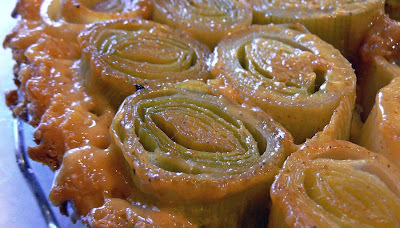 The leek sections arranged in the caramel sauce, before the crust goes on. I made my standard pie crust first thing Saturday morning and put it into the refrigerator to rest. 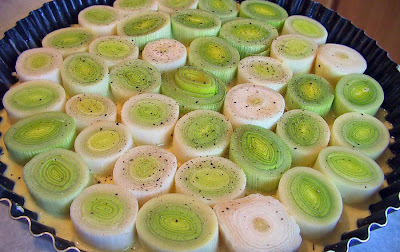 I cut the leeks into sections about half as deep as my pie pan. As with all tatins, don't use a pan with a removable bottom or the sauce will leak out. The finished tart, turned upside down. The last step before assembling the pie was to make the caramel sauce. 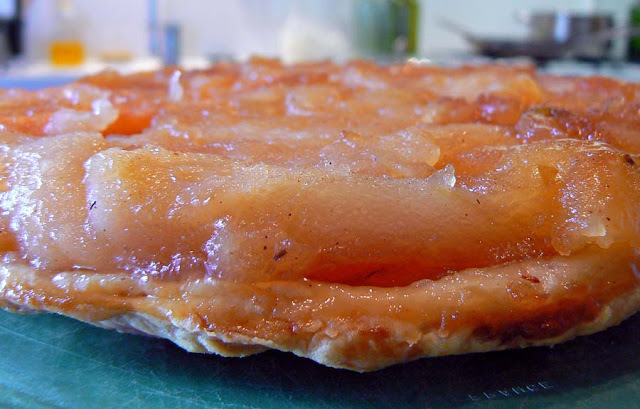 Remember, a tatin is an upside down pie that relies on a caramel for its look and taste. The caramel is made with 50 g sugar and a tablespoon of water heated over a medium flame. 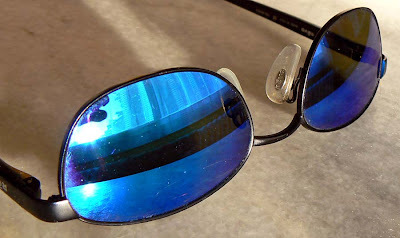 Once it turns brown, a tablespoon of vinegar is stirred in. Next, whisk in 25 ml of heavy cream and a teaspoon of curry powder. Who's ready for a slice? 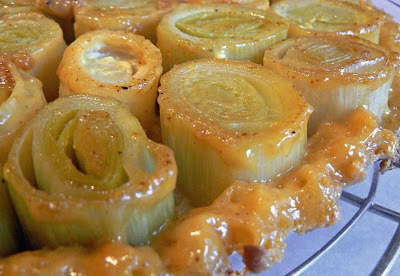 The caramel sauce gets poured into the pie pan, then the leek sections are arranged in the sauce. Next, a little salt and pepper and then the pie crust goes on top. It goes into a 180ºC (350ºF) oven for about forty-five minutes. After about five minutes of cooling time, the pie is flipped over onto a plate. The combination of sweet, savory, and curry spice was incredibly good. We ate it as an entrée before our main meal. And there's a good deal left over for tomorrow! We're going to make this again. By the way, my blog statistics tell me that I hit 100,000 visitors overnight. Woo hoo! This blog has been going for four years this month (October 16 to be precise) and now we've clocked a hundred thou. Thanks to all of you for coming by! I started writing this as a response to your well wishes in the comments section of yesterday's post, but decided I might just as well put it here. It's about food. 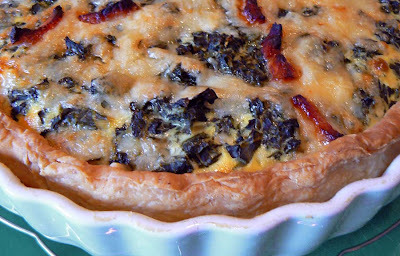 Smoked bacon, swiss chard, and onion quiche. Same as the little ones I made last Sunday. I've always noticed how, in the US, when someone dies, there is all kinds of food. People bring the grieving family all manner of prepared dishes, an they're often home made. The food is for the family, of course, so they don't have to think about cooking or shopping during the hard first days after their loss. It helps the friends and other family members who provide the food feel like they're doing something helpful. The food not only feeds the immediate family, but also the parade of mourners that stop by the house in those first few days. The first thing I thought to do after hearing the shocking news that our friend had died was to make something to take to his companion. So I made a quiche on Friday morning and we took it and a baguette over to her at noon. We've spent some time over there since Thursday, but so far I've seen no sign that this food-bringing is also a French custom. I guess I assumed that in a culture that emphasizes food as much as the French, I would see people bringing lots of food on their visits to the bereaved. Maybe food will come after the funeral on Tuesday. I've seen that in French movies, at least. It's weird to think of such things at a time like this, but as a foreigner I'm constantly observing, looking for clues about how to behave in every situation: what's expected, what not to say. Unfortunately, I won't be here for the services on Tuesday since I'm flying out that day to the US. I won't see first-hand how this all happens. Ken will be here, however, and he plans to attend the funeral, so I'll get a full report. I have noticed, however, that the wine, whiskey, and gin have been flowing quite freely. It calms the nerves. So I'm told. Our new friend Linda took this picture of us in early September. We were in the Auvergne, in Cantal, visiting the cows and the cheese makers. Thanks, Linda! 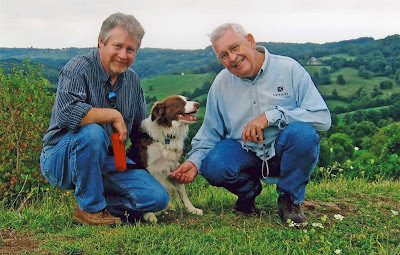 Walt, Callie, and Ken in Cantal. We had some sad news on Thursday. 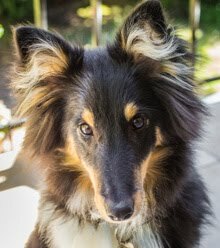 A friend of ours passed away in the night. He was young, only 52 years old. He suffered a heart attack and died in his sleep. We are very sad. He was a friend and a neighbor, someone we met very soon after we moved here back in 2003. We will miss him. Our thoughts are with his family -- we know his father, who's also a neighbor, and we've met his sisters and his son, who live in Paris -- as well as with his companion, a British woman with whom we've become friends over the past few years. Life is short. Shorter for some than for others. But still. Many of the wine makers around us do a late harvest wine by leaving some of their chenin blanc grapes on the vine for a few weeks beyond the normal harvest date. 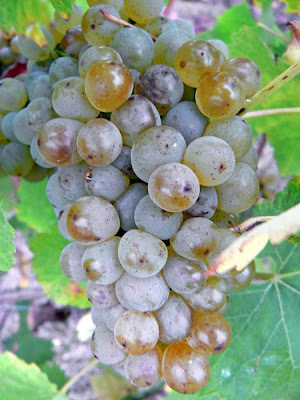 This concentrates the sugars as the grapes begin to shrivel and develop botrytis, the noble rot. 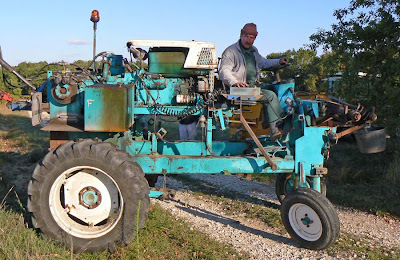 Jean-Noël on one of his tractors. 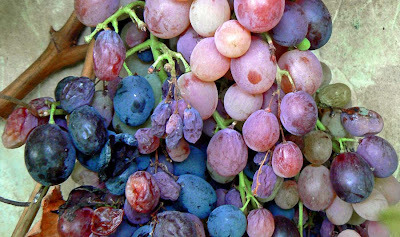 Often these grapes will be picked by hand so that only the best grapes will go into the wine. 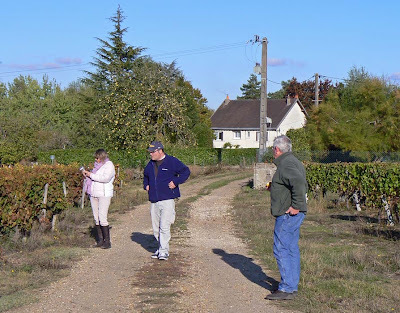 We've seen one of our neighbor viticulteurs Jean-Noël and his wife Chantal out there picking by hand in previous years. 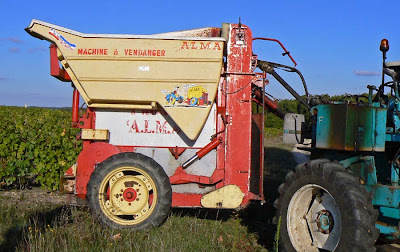 But this year they're a bit short handed and decided to harvest their chenin with the mechanical harvester. The harvester is pulled behind the tractor. We ran into Jean-Noël and Chantal out in the vineyard on Sunday harvesting their rows of chenin for this year's late harvest wine. He says it's a great year due to the warm, dry weather during the latter part of the season. Can't wait to taste the result! He also told us that next year we can join in with the hand-picking if we wanted to. We'll see about that. Depends on the hedge trimming schedule. The tractor says, "I'm having fun with my ALMA!" 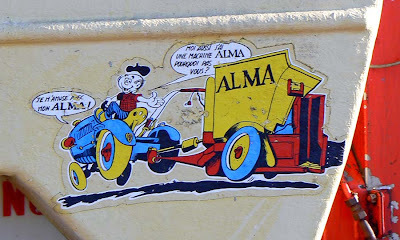 The guy says, "I, too, have an ALMA machine. Why not you?" 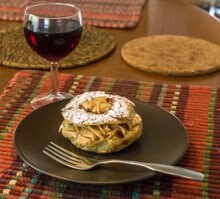 We drink sweet late harvest wines as apéritifs (before dinner drinks), with dessert sometimes, and during the holidays with specialties like foie gras. Yum! An interesting aside: the brand name of the harvester is A.L.M.A., a maker of harvesting equipment. Alma is also the name of the small private college that sponsored my year abroad program at the Alliance Française in 1981. 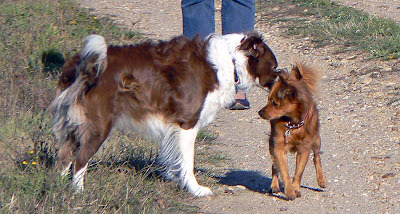 Callie meets one of the neighbor dogs in the vineyard. I don't know if these two have met up yet or not. But they were very good together. Leesa (News from France) and Alex came down from Paris to have lunch with us on Sunday. They got here early because they planned to make the food! Before lunch, however, we drove over to one of our wine-making neighbors for some tasting and wine purchasing. Jean-Noël, the viticulteur (grape grower and wine maker), had us taste some fresh grape juice and some bernache (juice that is beginning to ferment) before a full range of the wines he makes. 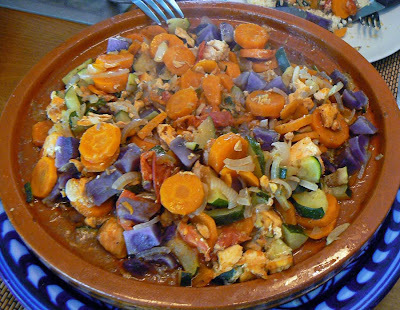 Tagine of salmon with fresh vegetables and spices. We filled the trunk up with wine: forty liters plus six bottles for us and at least a dozen bottles for Alex and Leesa, and headed back home to finish making lunch. Our guests brought all the fixin's for a tagine of salmon that included courgettes, carrots, tomatoes, onions, their own home made citron confit (preserved lemon), and little violet potatoes. All that got chopped up and stewed with spices in a special North African pot called a tagine, hence the name of the dish. 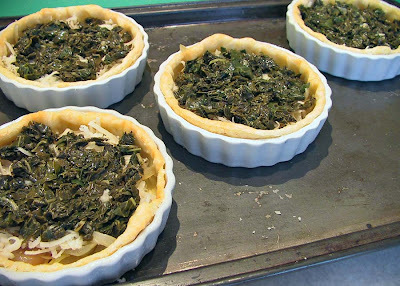 Quiches in progress, with layers of smoked bacon, sautéed onion, cheese, and cooked swiss chard. It was, needless to say, absolutely delicious! We served it with couscous, that little North African pasta that goes so well with these kinds of stews. 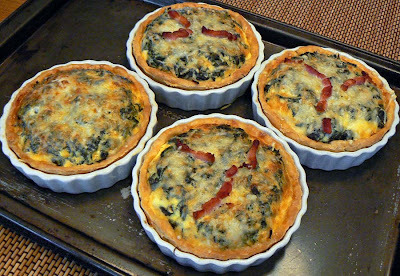 Earlier in the morning I made four individual quiches with swiss chard from our garden to serve as the entrée. The finished quiches. I made one without meat for Leesa. And before that we snacked on a pumpkin-filled pastry that Ken found at a nearby bakery and some sliced saucisson. 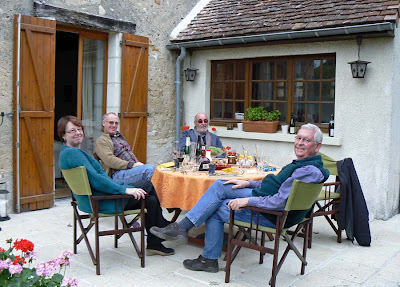 We started out drinking some of the moelleux (sweet apéritif) wine that Jean-Noël made and moved on to some of his red cabernet and côt with the meal. Yum. Leesa, Alex, and Ken at the start of our vineyard walk. Then the cheeses came out! After cheese we took a much needed walk in the vineyard and returned home for dessert. Again, Leesa brought an apple-cherry charlotte she had made on Saturday, and a few slices of her home made key lime pie. Wow. We had a great time and really appreciated Leesa's and Alex's generosity and culinary talents! Ken, Callie, and I were invited to fellow bloggers Jean's and Nick's holiday home for lunch on Friday. 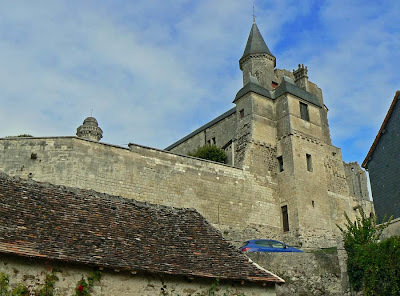 They spend their vacations about an hour south of us in a beautiful town that is built beneath a big medieval château. You can read about their adventures here. Jean and Nick, their friend Barry, and Ken relaxing around the table. We first met Jean and Nick this past August after having read each other's blogs for a while. 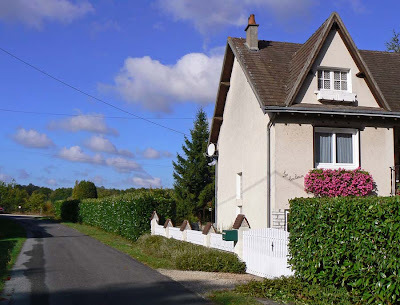 Jean tells the story of finding and fitting their house in France, which they've owned now for a couple of years. We got in touch and invited them to our place for drinks and munchies in the back yard. A slice of the rooftop views from Jean's and Nick's garden. Their home is lovely, warm, and welcoming. Callie had a great time playing with their poodle Lulu while we feasted on salmon, veggies, and potatoes and a generous platter of cheeses. The wine flowed as freely as the conversation. And even though it was a tad on the chilly side, we really enjoyed being able to sit out on the terrace for the meal. 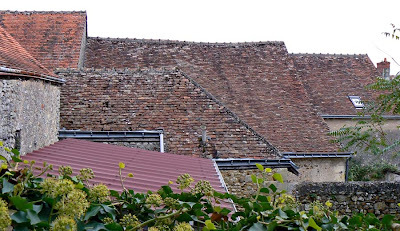 A view of the château from below. Jean and Nick will be heading back to Britain at the end of the weekend, but we're looking forward to seeing them again, maybe around the New Year. Now that the chill is on it's really starting to feel like fall has taken over. The vineyard is turning color and it won't be long before the leaves drop, leaving only the brown trunks and the wispy canes from this year's growth. The vineyards take on a yellow hue in the fall. Most of the grape leaves turn yellow and brown with some shades of orange mixed in. 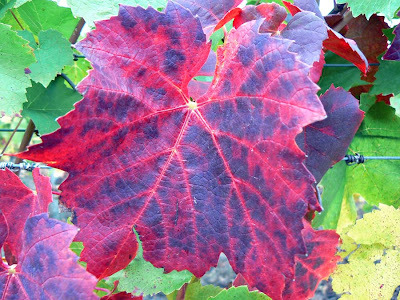 But here and there you can find some vivid reds among the vines. Not to mention intricate patterns of color as the leaves change. I have not yet mastered the skill of telling what kind of grape I'm looking at by the shape of the leaves. I have to rely on my memory, or what's left of it, to remember which grapes are where. And that's hardly reliable. So I make no claims as to which varietals these leaves belong to. You're on your own. 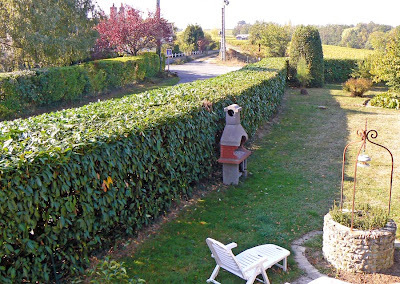 The hedge is finally done. I started around mid-September. There was no activity for about week in the middle due to rain, and I finished on October 15. Of course, my work day is not very long. I work for about two hours a day, maximum. 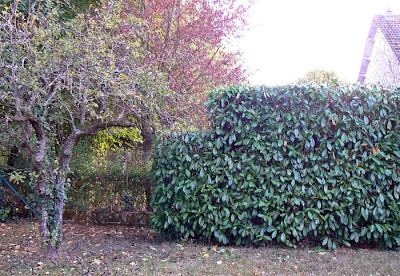 The roadside hedge (inside view) is finished! But that doesn't worry me. I go slowly, and I don't have to pay anyone to do it for me. And it eventually gets done. Yay me. And Ken did his share by raking up all the trimmings for the burn pile. 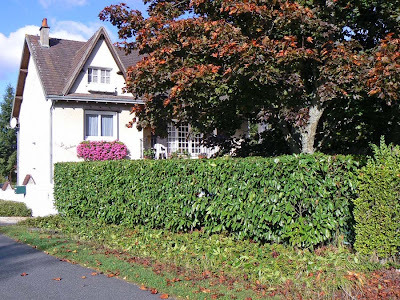 The last bit to get done was the roadside hedge, which is also the longest single section. It looks much shorter in this picture than it really is. And this year is the first year in three that I've actually trimmed the whole hedge and the bay tree without leaving any part undone. I feel very good about that. Now I don't have to think about this again for another year. And I'm hopeful that the ditch along the road will be filled in before I have to trim again. And you won't have to read about it again for another year. The days got nice again on Monday, which means I'm back at the hedge trimming. There really isn't much left to do. So I'm taking my time, hoping against hope that the town will fill in the roadside ditch before I get to the final part. The short section along our road. Done! 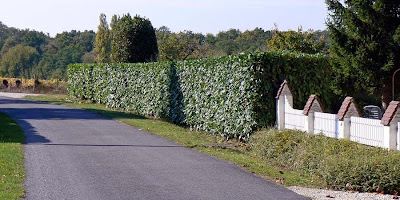 The roadside hedge is in two sections: a short section along the front yard and a long section along the back yard. The inside has been done for a while. So my first step was to finish the short section. I stood in the ditch to do the vertical part, and bridged the ditch with old shutters to get the ladder close enough to do the top. It was pretty easy, but there's not much of it to do. The long section behind the house is all that's left to finish. The longer section is harder because of having to move the shutters every couple of meters. But rather than get started on that, I decided to cut a notch out of the tallest part of the hedge between us and the neighbor. It's on the northeast corner and is right up against the neighbor's fence. There's also a pear tree very close on our side of the yard. I figured that by notching the hedge, it will be easier to trim next year. I won't have to teeter on the ladder where the hedge is tallest and dodge the limbs of the pear tree. I also think that the notch adds a little je ne sais quoi to the whole thing. Like sculptcha (that's "sculpture" in New Yorkese). *** UPDATE: I finished the vertical part of the long hedge on Wednesday. Just the top left to do. *** UPDATE: This morning I finished the top. Now it's all done for another year. 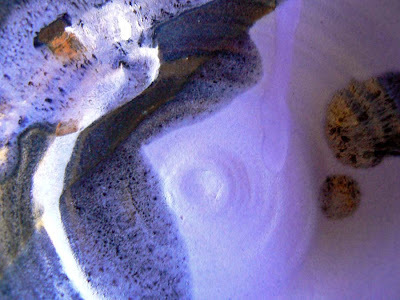 A bowl hand-made by our friend Sue who loves all things blue! 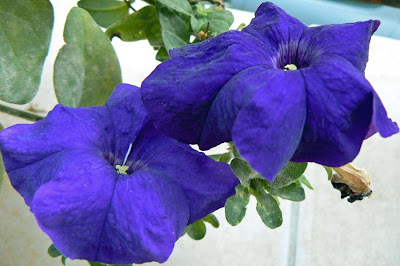 Blue petunias on our deck this year. 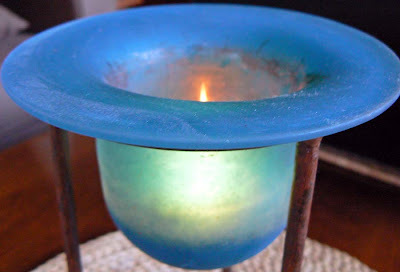 A luminaire in blue given to us by our friend CHM. 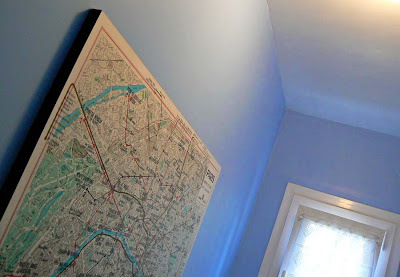 The walls in our w.c. are painted blue. One of my favorite books and a mail order catalog. The Washington DC Metro Blue Line. By the way, the title of this post is the title of a song. Ten points to the first one who tells me who sang it. No fair using the internet! 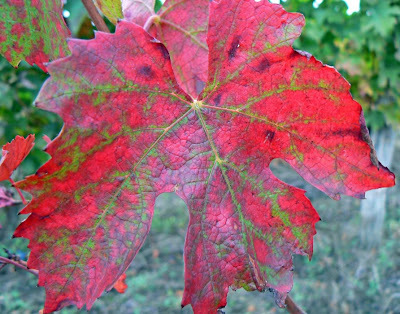 The vineyard is full of fruit in the fall, and not just grapes. Every fruiting bush and tree is putting forth its bounty: walnuts, chestnuts, apples, roses, and countless varieties of berries. 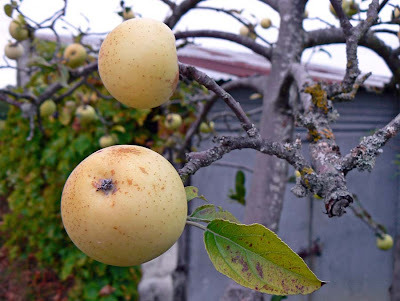 The summer fruit is mostly gone, but some plums remain, shriveled into prunes, waiting to become a meal for somebody, be it mammal, bird, insect, or bacterium. What the neighboring humans (like us) don't gather, the local fauna will. There is one walnut tree on the vineyard road, but I didn't get any of them this year. One of our neighbors was out early one morning with a bag picking up as many nuts as he could. He said they were pretty small this year. Apples ripen on a small tree in the vineyard. 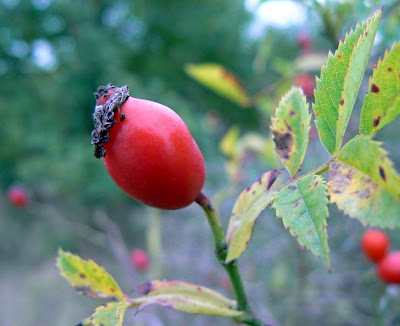 The roses that grow wild out on the edges of the woods put on quite a show in the fall with their cherry-red hips standing out brightly against the green and brown stems. Many of them will remain through the winter before finally disappearing. There's not much happening right now out in the vineyard. Most of the harvest is in, although there are still some sections waiting to be picked. The leaves are starting to turn. Yellow. Red. Brown. Rows of white grape vines after harvest, turning yellow. Some of the grapes are being left for what they call the late harvest. That is, the growers are waiting for maximum sugar and a bit of "noble rot" before they pick the grapes to make their sweeter wines. Chenin blanc, hanging on for late harvest. Some of the grapes that escaped the harvest are turning into raisins. These will most likely feed the birds or the deer or the foxes. 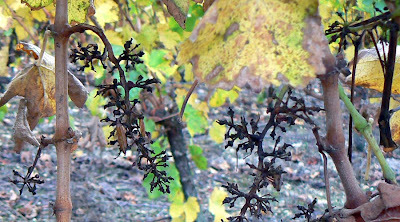 Grapes that decorate the maison du vigneron turning into raisins. 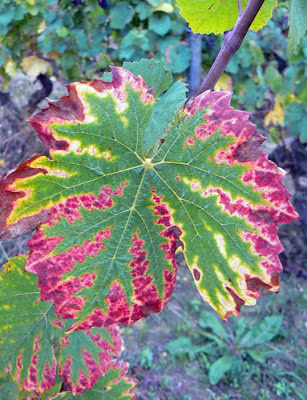 Fall is a very interesting time in the life of the vineyard. The pheasants are out there, running around to escape the hunters. The rabbits are doing the same. And the vines are doing their thing, getting ready for the winter pruning. What's left after the harvest. I made a second tarte tatin a few days ago. Just as good as the first, only this time we had a coing (quince) and a poire (pear) in the house, so I added them to the apples. I also added a little cinnamon for fun. It was tasty. 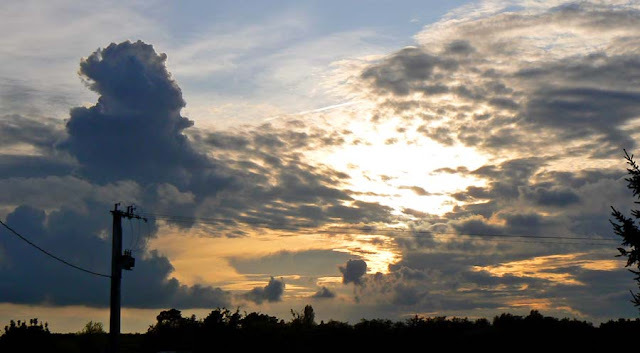 As these fall weather systems organize and come through, we get amazing clouds and sunsets. This one came a couple days ago. Sunday's sunset will probably not be spectacular seeing as it's supposed to be mostly overcast and it may rain. Yard work really slows down when it's wet out there. But there is still much to do, so we wait for sunny days. In the meantime, we cook and watch tv. Still, there's the garage to clean out, the outdoor furniture to get in, and housework to keep us both busy. Ah, life in France!